Drew Edward Johnese died at home unexpectedly on November 10, 2016. Drew was born at Peralta Hospital in Oakland, California to Lucas B. (John) Johnese and Virginia Lee Johnese, Nee Cox, on September 3, 1951. He had two older brothers; Daniel and Randall (Randy) and was followed by a younger brother, Larry. Drew attended John Muir Elementary School in Hayward, Woodrow Wilson Elementary School in San Leandro, John Muir Junior High School in San Leandro, where he met his future partner Charlotte Williams, and Pacific High School in San Leandro. He graduated from San Lorenzo High School in San Lorenzo and went on to attend Laney Community College in Oakland and Chabot Community College in Hayward where he received an Associate of Arts Degree in Photography. Shortly after leaving College, Drew relocated to the Willamette Valley in Oregon. There he apprenticed with his father's plumbing company and, ultimately started his own plumbing company. He also taught Plumbing Science at Lane Community College. Following the economic downturn of 1979-80, Drew gave up his plumbing business and returned to California. He worked for Alameda County and the City of San Ramon as a Building Inspector. In 1987, Drew again relocated to Southern California to take a job with the International Association of Plumbing and Mechanical Officials where he worked on editing the Plumbing and Mechanical Code. In 1990, Drew returned to Northern California and took a job with the City of Fremont as a Building Inspector. He was later promoted to a position with the Fremont Fire Department as an Hazardous Materials Technician. Drew also had a consulting business the Safety Guy which provided training to businesses in safety preparedness including the proper maintenance and handling of hazardous substances. Drew retired from the Fremont Fire Department after a disabling accident in 2005. Drew had many interests. 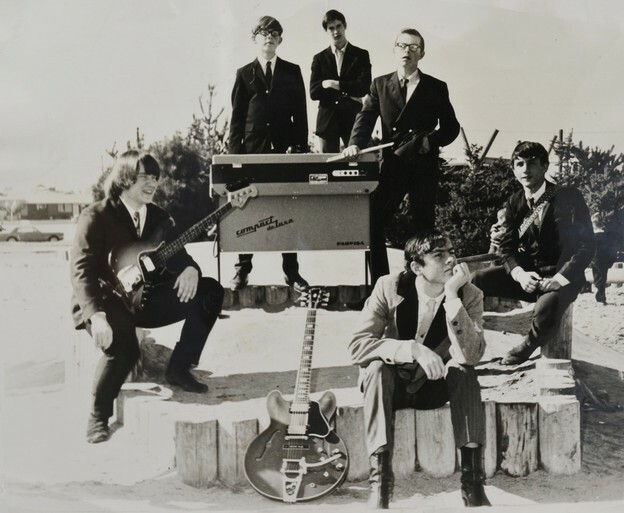 He was a talented singer, guitarist and songwriter and performed with several musical groups including The Mysterians, The Fellowship of the Rings, The Sagebrush Brothers and the Big Dog Band. He continued to play and sing in to his retirement. He also made custom guitars which he labeled Uncle John's Custom and which he generally gave to lucky musicians. Drew also had a life long love of writing which generally took the form of short stories or essays but after retirement he went for the long form and wrote two novels. Both, unfortunately, went unpublished but are well worth reading none the less. Also, after retirement, Drew took to travel with his partner, Charlotte Williams. He loved to plan independent explorations of cities such as Paris, Rome and London. He had just returned from China shortly before his death. Drew's favorite pastime though was golf. He wasn't great but he was avid and he loved to help others learn the game. Even as he fought with cancer, he continued to play golf. The Sunday before his death he played a foursome and he was at the top of his game posting the lowest score of the foursome. He had a great day! Drew is survived by his partner, Charlotte Williams, his brothers Daniel, Randy and Larry, best friend of 30 years, Bill Craven, and too many other family and friends to name. A memorial meeting and celebration of Drew's life will be held on January 7, 2017, in Hayward. Those wishing to attend or send flowers/messages should RSVP to drewslifecelebration@gmail.com. Donations in Drew's memory may be made to the Southern Poverty Law Center, National Public Radio or the Cancer Society . Sorry to hear about Drew's passing. We went way back to Woodrow Wilson. Drew was a good guy. Gone but not forgotten. Drew was one of my closest friends, and my big brother. He made more than a few life-long friends in the classrooms, hallways and parking lot at Pacific High. One of his wild adventures off-campus led to his being forced out of Pacific before I got a chance to attend PHS with him. But, he never dropped out of school, he never stopped learning. He continued his education, professionally and personally, for the rest of his life. He earned an AA in photography, became a journeyman plumber and went on to join and work for one of the national orgaizations that develop and write building codes. He became a building inspector in Alameda county, and, from there earned and worked his way into the Fremont Fire Department as a Hazardous Marterials Inspector. He was widely respected around the region and state for his knowledge, insight and abilities in his field. Drew was always curious and active--photography, salt water fishing and boating, SCUBA diving, travelling to Europe and China. He was working on his Hayward hills home, as well as Charlotte's home in Livermore, and was always there to help neighbors and friends with their projects. Drew loved music. He played guitar and sang all his life. He even made a few custom electric guitars in a shed/garage shop he set up. After he retired, he wrote two novels (the first, a political thriller set in the Bay Area, and the second, a delightful magical-realism type novel titled "The Rose Letter".) Neither of them were published, but both are worth reading. He also authored a technical manual for hazardous materials management. But Drew's best loved activity these last years has been golf. He loved the game, and he loved introducing the game to new players. He was a wonderful teacher with a great ability to help you see what he saw in your golfing, as a way to improve your game. I miss him terribly already. Family and friends are planning to celebrate Drew's life soon, probably in January. If anyone is interested in details, please email me at lfjohnese@gmail.com. Shortly after leaving College, Drew relocated to the Willamette Valley in Oregon. There he apprenticed with his father’s plumbing company and, ultimately started his own plumbing company. He also taught Plumbing Science at Lane Community College. Drew had many interests. He was a talented singer, guitarist and songwriter and performed with several musical groups including The Mysterians, The Fellowship of the Rings, The Sagebrush Brothers and the Big Dog Band. He continued to play and sing in to his retirement. He also made custom guitars which he labeled Uncle John’s Custom and which he generally gave to lucky musicians. Drew also had a life long love of writing which generally took the form of short stories or essays but after retirement he went for the long form and wrote two novels. Both, unfortunately, went unpublished but are well worth reading none the less. Also, after retirement, Drew took to travel with his partner, Charlotte Williams. He loved to plan independent explorations of cities such as Paris, Rome and London. He had just returned from China shortly before his death. Drew’s favorite pastime though was golf. He wasn’t great but he was avid and he loved to help others learn the game. Even as he fought with cancer, he continued to play golf. The Sunday before his death he played a foursome and he was at the top of his game posting the lowest score of the foursome. He had a great day! A memorial to Drew Johnese will be celebrated on January 7, 2017, at the Mission Hills Golf Course Restaurant (275 Industrial Parkway, Hayward, CA 94544) from 3 to 6 pm. RSVP to: randyjohnese@mac.com In lieu of flowers please send donations in Drew’s memory to the Southern Poverty Law Center, National Public Radio or the Cancer Society. As you know from Drew's brother's post Drew passed away Thursday (11/10). Drew and I had a wonderful life together. We have been living together for a long time. We traveled the world together the last seven years. This year we went to San Diego, London, Edinburgh, Dublin, Beijing, Xian, and Shanghai. He was the perfect tour guide; always knowing which Metro line to catch to go wherever. His abilities in the area mimicked other things he did in his life. He never ceased to amaze me. My son, Remington, said to me one day "Mom, is there anything Drew doesn't know how to do?" Drew treated me like an absolute princess and I will never forget the love he poured over me. He was the most intelligent man I have ever known. I miss him terribly but I know he will never be forgotten. He touched the lives of many people and was always helping someone with something, never expecting anything in return. My adorable man is now at peace and hopefully watching over my golf game. He taught me to golf. Every Sunday we met with friends to play golf. It was a wonderful life! James and I were so very sad to learn today of Drew’s passing. We both have many fond memories of Drew during his time at Pacific High and during his youth during the turbulent but fun 60’s. We are cheered to hear of his personally rewarding career and of the exciting & interesting life he shared with his life partner Charlotte. We send are heartfelt condolences to Charlotte, Dan, Randy, Larry and all their clan. This is a photograph of Drew and his rock'n'roll band. 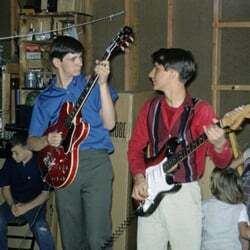 Drew and his brother Randy were co-leaders of the band. The boys that you see here played bass guitar, drums, rhythm guitar, electric organ, and bass guitar. The band only used Gibson and Fender electric guitars (nothing but the best).